The Double Yellow Head or Yellow-headed Amazon (Amazona oratrix aka Amazona ochrocephala oratrix) is probably the best known of all the Amazon Parrots. Differentiating it from other related amazon parrots, this amazon possesses both the yellow nape and yellow crown - hence a "double-yellow" head and the origin of its name. This parrot is endangered in its natural habitat in Central and South America. In the wild, they generally form large, noisy flocks. They reach sexual maturity at 3 to 4 years of age. During breeding, they live in monogamous pairs and nest in hollow tree limbs. They lay an average of 2-3 eggs, which are incubated for 26 - 28 days. Their lifespan ranges from 60 to 80 years. 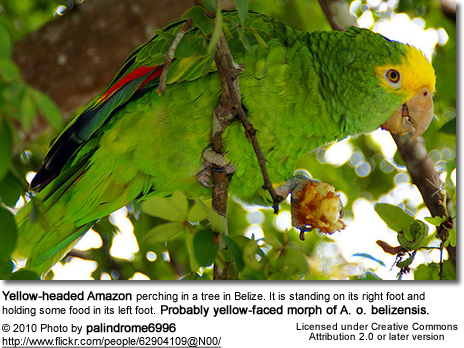 Belize Yellow-headed Amazons Amazona oratrix belizensis, previously Amazona ochrocephala belizensis: Belize. Amazona oratrix hondurensis: Sula Valley, Honduras - Only recently described, while the population in north-western Honduras and adjacent eastern Guatemala (near Puerto Barrios) resembles belizensis and commonly is included in that subspecies, but may actually represent an undescribed subspecies. It has sometimes been referred to as guatemalensis, but until officially described, the name remains provisional. Amazona oratrix magna - from the Pacific slope of Mexico. Most authorities consider this subspecies invalid. The Yellow-headed Amazons are endemic to Guatemala. They were previously also found along the coastal slopes of Mexico from the Tres Marías Islands and Jalisco to Oaxaca and from Nuevo León to northern Chiapas and southwestern Tabasco, as well as a disjunct area including most of Belize, as well as northwestern Honduras. They inhabit riparian forest and areas with scattered trees, as well as evergreen forest in Belize and mangroves in Guatemala. Introduced populations can be found in Stuttgart, Germany where a population of over 50 individuals resides. Smaller introduced populations are to found at Imperial Beach, San Diego and Santa Anna both in Southern California. These parrots occurs in singly or in pairs, in small groups, and occasionally in big flocks. Their numbers have been reduced drastically—by 90 percent, to 7,000, from the mid 1970s to 1994, and by 68 percent from 1994 to 2004. The main reason being trapping for the pet trade and habitat destruction. The Yellow-naped Amazon averages 15 - 17 inches (38–43 cm) in length (including tail). When excited all feathers of the neck and crown are raised, making the head appear double in size. They have a robust build, rounded wings, and a square tail. The body is bright green, with yellow on the head, dark scallops on the neck, red at the bend of the wing, and yellow thighs. The flight feathers are blackish to bluish violet with a red patch on the outer secondaries (shorter, upper "arm" feathers). The base of the tail also has a red patch, which is usually hidden. The outer tail feathers have yellowish tips. The bill is horn-colored, darker in immatures of the Belizean and Honduran subspecies. The eye ring is whitish in Mexican birds and grayish in others. Male and female look alike. 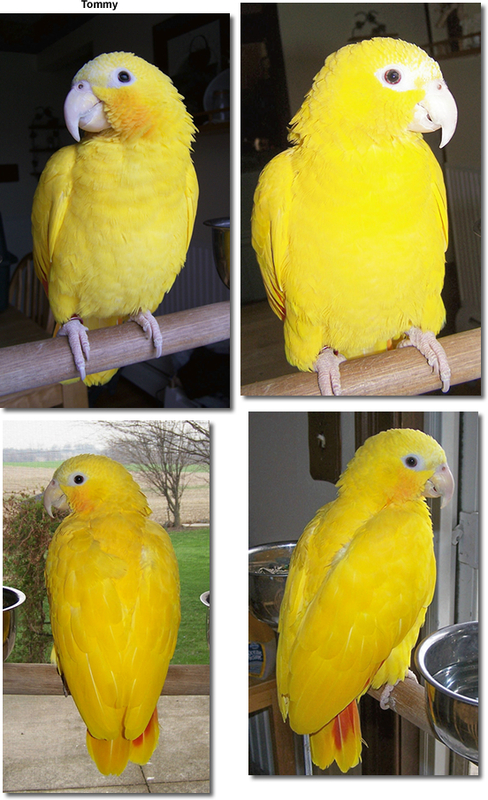 Mutations: Lutino and blue mutations and myriad variations have been produced in aviculture. 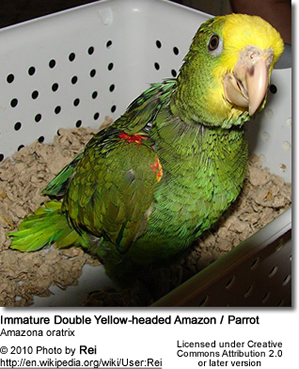 Below is a photo of Tommy - a beautiful and rare mutation double headed amazon. According to his owners, he is a great pet. He likes attention and wants to be close to the action. He can be very vocal screaming "come here, come here!" Like just about all parrots, he likes to discipline by biting from time to time. Training is recommended to prevent undesirable behavior. 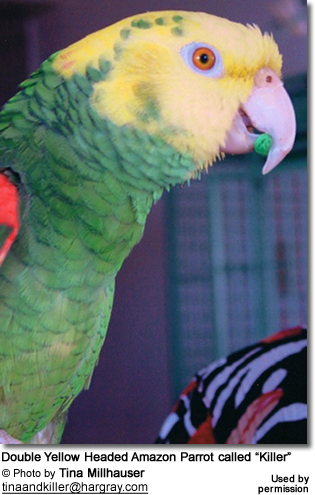 These beautiful parrots are very intelligent and imaginative birds that are easily tamed as they enjoy human company. 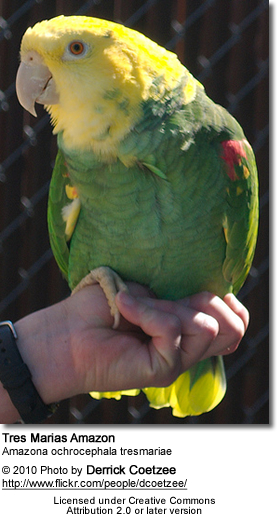 Therefore, they have grown to be very popular in the pet bird trade. They are considered very good talkers and singers. 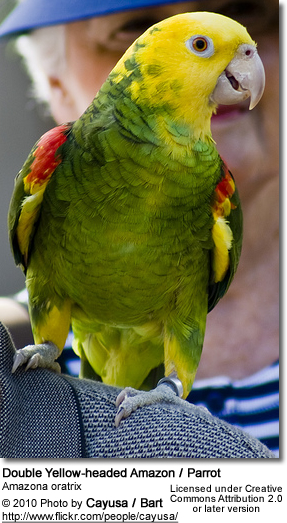 Some become nippy and they may not be the right pet for the casual owner who doesn't want to take the time to learn about parrot behavior and training. They are generally known to be noisy, thus they may not be suitable for individuals who are intolerant to noise. As is the case with most mid-size to large parrot, they can be destructive unless their energy is redirected at chewing toys, natural and non-toxic branches, and training of tricks. Bird Nutrition ... In the wild, its natural diet consists of seeds, nuts, fruits and plant material. 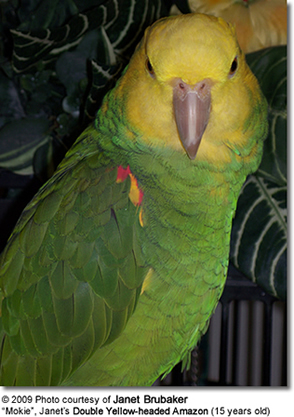 To learn more about the diet of the captive Amazon Parrot, please visit this webpage.